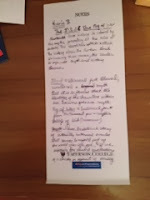 In preparation for this blog's 5th birthday, I played a wee bit with the layout. For any and all links to websites and blogs, check out the the new Interesting Websites & Resources page. I know it's just barely Thursday, but here's my contribution to #throwbackthursday. Today was another miserable wintry day here in New York, which meant that I decided to organize my bookshelves. It was overdue. Anyway, inside a copy of The Iliad, which I've decided I no longer have need for, I found that pamphlet inside. That's the first college assignment I had. 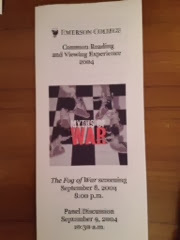 My college did this thing--don't know if it still does--called the Common Reading and Viewing Experience. You're assigned a text before freshmen year officially begins. You (theoretically) read said text. You then watch a movie during orientation week that somehow ties in to the idea behind a couple of possible essay questions. You were then supposed to write said essay in your College Writing class. That year, the text was The Iliad and the movie was The Fog of War. You probably can't read the notes. They say:thesis: The Iliad and The Fog of War illustrate that history is colored by the myths prevailing at the time of events. The identities within suffuse the history also. The further back in history these occur, the harder to separate myth and history become.And the second paragraph says: Iliad--historical fact blurred; considered a myth, but it is so famous that the identity of the characters within are known; gods are myth. Fog of War= historical fact from McNamara's point of view--mythic beliefs (domino theory, communism)I don't remember writing the essay though. I think I had to, being a Writing major. Aw, thanks! I genuinely don't remember writing the essay. I should ask my college roommate. She might remember better. I know that stuff that trailed off in the last draft of the story are now tied in better and taking in info from my beta, I was consciously trying to write toward something. I'll probably start the actual writing over the weekend. We're getting more snow Sunday to Monday, which is perfect for writing time. And yeah, the NaNo only needed another two or three scenes. I figured why not?